Some say artificial intelligence is evil; others worry about AI replacing them. Is it scary to you? According to Elon Musk, CEO of Tesla and SpaceX as well as chairman at SolarCity, artificial intelligence (AI) is a "fundamental risk to the existence of human civilization," and "if you are not concerned about AI safety, you should be. [It is] vastly more risk than North Korea." So, is AI safe? Is it a good thing or a bad thing? The potential for job disruption is another area of considerable AI concern. In a 2013 study, University of Oxford researchers estimated that 47% of total U.S. employment is at risk because of "computerization." (Computerization, according to these authors, is about job automation by means of computer-controlled equipment. Clearly some of this computerization comes from AI technology. 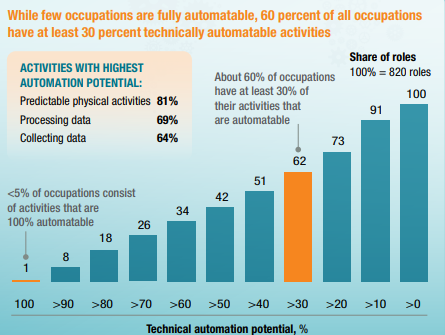 More recently, in a 2017 study, McKinsey suggested that "half of today's work activities could be automated by 2055, but this could happen up to 20 years earlier or later depending on the various factors, in addition to other wider economic conditions.... Activities most susceptible to automation involve physical activities in highly structured and predictable environments, as well as the collection and processing of data. In the United States, these activities make up 51% of activities in the economy." The study looked at the potential global economic impacts of data and analytics, automation, and AI. Earlier this year, the Socio-economic Planning Secretary of the Philippines stated that the entire business process outsourcing industry (read outsourced call centers) in the Philippines, or approximately 900,000 workers, is in danger of being wiped out because of speech-automated processes and bots. Is AI and the automation it cultivates going to wipe half of the jobs in the U.S. and many abroad? Probably not. The previously referenced McKinsey study also stated, "More occupations will change than will be automated away." The implication is that we should expect to see significant workforce disruption in the next 20 to 30 years because of AI and automation, but the experts differ on whether this will be dire for entire countries and certain unskilled segments of a population, or generally a good thing for entire countries and their economies. As AI begins to enter the communications industry, we should probably ask whether there's cause for alarm -- or optimism, or both. The first wave of AI automation in our industry began with the use of natural language processing (NLP), primarily in bots, call center audio, and text processing, but also in some advanced multichannel sentiment analysis capabilities. In fact, you'll find many of these capabilities exhibited in products found on the show floor at the upcoming Enterprise Connect 2018 expo, and discussed in numerous educational sessions on speech processing, sentiment analysis, and NLP at the conference. A second wave of AI automation is now entering in the form of business-focused intelligent assistants (offered by IBM and Cisco, most notably) and some higher-order cognitive capabilities targeted toward improving individual agent and overall contact center performance. This second wave relies not just on the data found in the contact center or the CRM system, but in a host of other data sources now available (see my January No Jitter post for more details). We are seeing these kinds of systems from Afiniti, eGain, Genesys, IBM Watson, Salesforce, Spoken (now Avaya), Sundown.ai, and a number of other players marketing productivity tools for collaboration workforces and the contact center. Given these developments, you have to ask yourself how much you need to know and understand about AI, and perhaps, just at a high level, how it works. A November 2017 No Jitter survey asked this question. A surprising 27% of enterprise IT respondents indicated that knowing about AI is important for their career advancement. 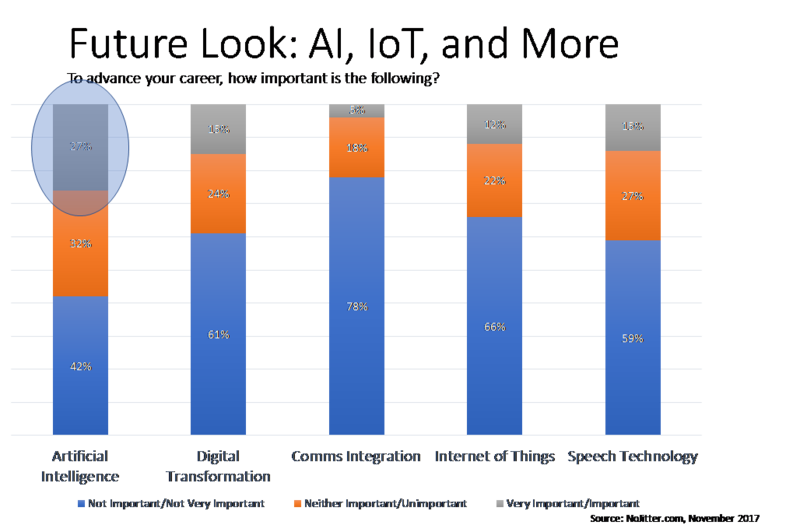 No Jitter survey data suggesting that 27% of our peers already believe AI is important for career advancement. To help you better understand AI and how it may impact you and your organization, I'm inviting you to attend the premier session at Enterprise Connect on AI: "Understanding AI – Beyond the Hype." In the first half of this 75-minute Tuesday afternoon session, an AI tutorial will help you understand what machine learning is and how it works, what deep learning is, how and where AI is intersecting with the communications space, how bots work, and how some of the deeper cognitive functions coupled with big data are entering the contact center space. In the second half, a stimulating panel discussion with representatives from Afiniti, Genesys, IBM, Microsoft, and Salesforce will address the subject of AI in a communications context and take your questions. Automation is generally perceived as a societal benefit because it has ultimately created more jobs than it destroys, and in the end, it eventually lifts society as a whole. But is AI different? Will AI automate faster than workers in society can be trained to do new jobs? A 2015 McKinsey Global Institute study stated, "compared with the Industrial Revolution of the late 18th and early 19th centuries, ... disruption of society is happening ten times faster and at 300 times the scale. That means roughly 3000 times the impact." So where does all of this lead us? To Enterprise Connect where you can come and engage with experts from companies making products and services for our industry: from AI-based personal assistants to speech recognition tools to bots to deep cognitive solutions for contact centers. This is one session you shouldn't miss at EC18. It will help you decide for yourself whether or not AI will prove scary to you! Learn more about Artificial Intelligence (AI)/Analytics at Enterprise Connect 2018, March 12 to 15, in Orlando, Fla. Register now using the code NOJITTER to save an additional $200 off the Regular Rate or get a free Expo Plus pass.